Packed with milk and dark chocolates, this pouch has a key ring, a snap clip and zipper closure. 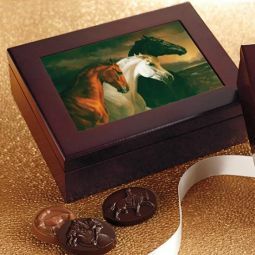 Give as a gift or treat yourself! Made of vegan material. 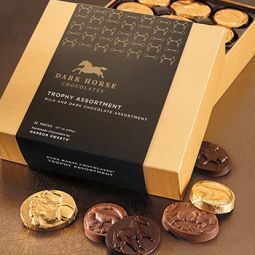 6 Pieces Includes one each of the following: Hunt Collection (milk chocolate): Full Cry Almond Buttercrunch Toffee, Fox Trot Creamy Butter Caramel, and Tallyho Solid Milk Chocolate. 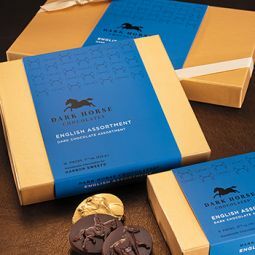 English Collection (dark chocolate): Dressage Classics Almond Buttercrunch Toffee, Grand Prix Jumpers, Creamy Butter Caramel, andPeppermint Ponies Peppermint Crunch. 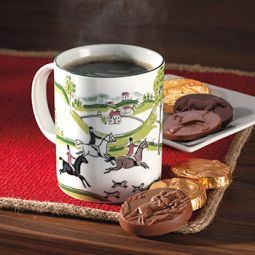 Hunt Scene Horse Mug with Chocolates! 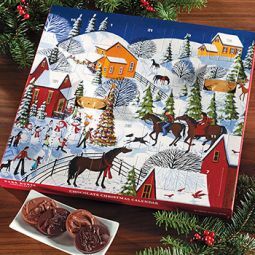 Chocolate Christmas Calendar - "A Gift from Grandma"